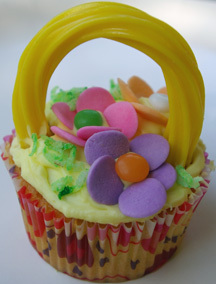 Put all your Easter eggs in one basket with this cute, chocolately Easter basket cupcake. 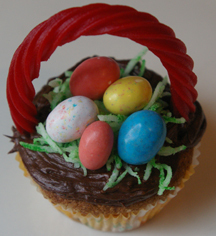 What You Need: 1 cupcake; chocolate frosting; shredded coconut tinted with green dye; candy eggs (we used Robin’s Eggs); red, twisted licorice whip; butter knife. How to Make It: Frost cupcake. Sprinkle bit of tinted coconut in center of cupcake. Use butter knife to make slots at two opposite sides of cupcake so you can insert the licorice handle. Add eggs.